In the morning we skip the breakfast but rather spent one hour in the gym. Next is a visit to the bridge to find out where we are, what the next waypoint is, our speed, looking at the radar for ships in the area and anything special happening. Noon we have lunch and around 18:00 dinner is served in the officers mess. Before going to bed we spent more time on the bridge. We forget what day of the week it is (It doesn’t really matter, they are all the same) and measure our progress in the number of days at sea. 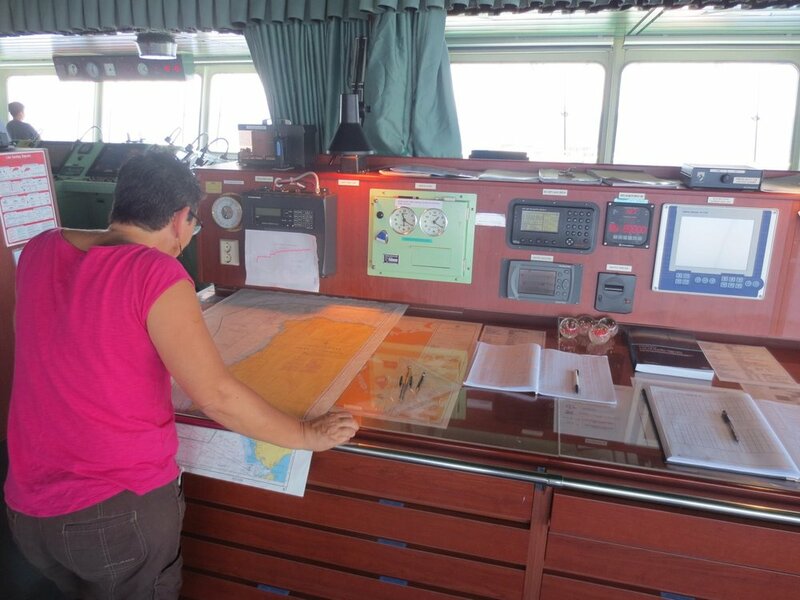 In between our new daily rhythm, the Chief Officer Selenic gave us a tour around the ship and the cook proudly explained to us how he feeds all on board. We participated in an ‘abandon ship’ drill when we were trained to get into one of the two lifeboats. Selenic showed us the engine room: when was the last time you have seen a V-12 engine with 97000 HP? Today an announcement was made on the PA system that we have crossed a time zone and all ship clocks automatically skipped one hour. Inside the superstructure, which includes the living quarters, the bridge, outside platforms and stairwells, all people dress very casual. However, when going on and below deck and inside the engine room, we must wear blue overalls with reflective stripes and hardhats. Nevertheless, the officers will a turn a blind eye when Francien and I just walk to the bow wearing only our hardhats. Three days before reaching Beirut the crew organized a BBQ on the aft D deck. The Philippino’s turned a suckling pig above the fire, the cook provided steaks, chicken, sausages, squid and lamb chops for everyone themselves to grill. The table tennis table from the gym was used to build a makeshift long table, chairs and benches from all over the ship collected to sit on. This bi-monthly event is the only time officers and crew socialize together. Everyone enjoyed this welcome break in their otherwise boring daily routines. Our cook used to work on European cruise ships, so hopefully that is a good sign! So far the food is tasty and Joel tries to accommodate the different tastes of the Croatians, Serbians, Philippino’s and his only two passengers. In the officer’s mess on the B deck there is a small buffet and a long table with white cloth seating ten persons. The captain is sitting at the head and all officers have each their own place according to their rank. We as passengers are always greeted with a friendly ‘Good Appetite’ and sit at a round table next to them: a seating arrangement which cannot be changed! The captain, a small built Croatian, does all the talking. With a non-alcohol policy on board for the crew, only the passengers are being served with one bottle of wine for dinner! 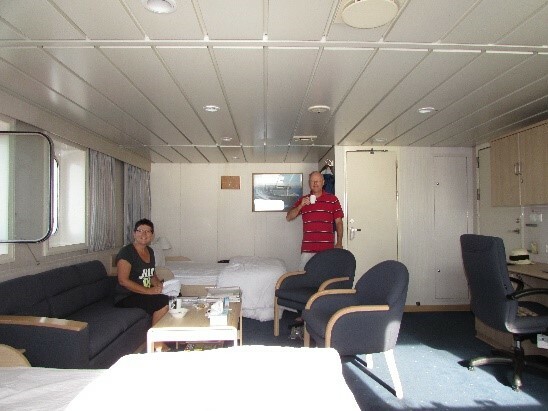 Our cabin has two beds, 2 aft and 2 port windows giving us an airy unrestricted view across the ship and sea 35 meters above the waterline, a desk with a telephone which never rings, a fridge which we filled with our favourite sweets and a comfortable bathroom: it is all clean and sturdy. On our National Geographic map stuck to the wall we track our course. The ship has Wi-Fi and indeed an internet connection, but it is slower than a carrier pigeon when trying to send e-mails! Getting onto the internet is virtually impossible. On the sea it is much quieter than in the port as the seas have been smooth with 1 - 2 meter swells. Besides the rushing of the waves, the only other sounds we can hear are the humming compressors of the refrigerating containers on the forward ship and the rhythmic thumping of this gargantuan engine. Occasionally one of the heavy metal doors slams shut with a funereal clang. However, after the first few days we do not notice these anymore. Time passes quicker as expected. We are relaxed and busy making pictures, writing, reading, talking to the crew, watching other ships passing by, observing the crew cleaning the ship and doing painting jobs and just watching the ever changing seas. I try to catch a FM radio station when close to shore, maybe a subconscious way of trying to contact the outside world! The officers on the bridge have put on their bright white uniforms and the pilot boarded at 21:00. It takes two hours to berth the ship. Francien and I are looking forward to go on shore tomorrow morning early. Beirut is our last chance to stock up on our favourite provisions and check up on the latest news before heading towards the Suez Canal.